The web giant’s fuel-cell play is an extension of the flanking strategy it used to great effect with AWS. A couple of weeks ago, Amazon signed an agreement with fuel-cell forklift maker Plug Power. Upon purchasing $600 million in goods and services (7x Plug’s 2016 revenues of $86 million), the internet behemoth would have the right to take a 23 percent stake in the firm. The news probably drew chortles at Tesla -- Elon Musk has been withering in his criticism of hydrogen and fuel cells. And it probably caused groans at Kroger, Carrefour, Central Grocers, and especially Wal-Mart, which accounted for 19 of Plug Power’s 73 disclosed fuel-cell forklift deployments at time of writing. Thwarted in the cloud -- Wal-Mart built its own infrastructure, rather than relying on Amazon Web Services (AWS) -- Jeff Bezos wormed his way into his archrival’s distribution centers instead. Amazon’s fuel-cell play is an extension of the flanking strategy it used to great effect with AWS, which allowed the company to insert itself into the value chains of countless businesses it would never otherwise supply. Amazon leveraged its early lead in cloud services to create a value proposition so compelling that -- in its earlier years, at least -- competitors faced the dilemma of becoming customers (benefiting Amazon) or settling for inferior or costlier alternatives (benefiting Amazon). A stake in Plug Power would allow Amazon to replicate this strategy in the materials handling sector, where Plug’s fuel cells offer significant advantages over the incumbent lead-acid batteries. Reclaimed space: At a distribution center, battery recharging infrastructure generally consumes 5 percent to 10 percent of the footprint, most of which can be repurposed for goods storage by switching to hydrogen. (Plug estimates this number at 7 percent on its website.) The client saves on capex from not having to develop as many new distribution centers. Faster forklifts: Lead-acid batteries’ voltage drops as they discharge, slowing forklifts, causing a productivity decline as the shift progresses. (Plug estimates battery forklifts’ speed drops an average 14 percent in the second half of an eight-hour shift.) Problems are exacerbated in refrigerated warehouses, in which batteries may only last half a shift. In contrast, fuel-cell forklifts can achieve a steady “pick rate,” so clients can turn over their inventory more quickly. 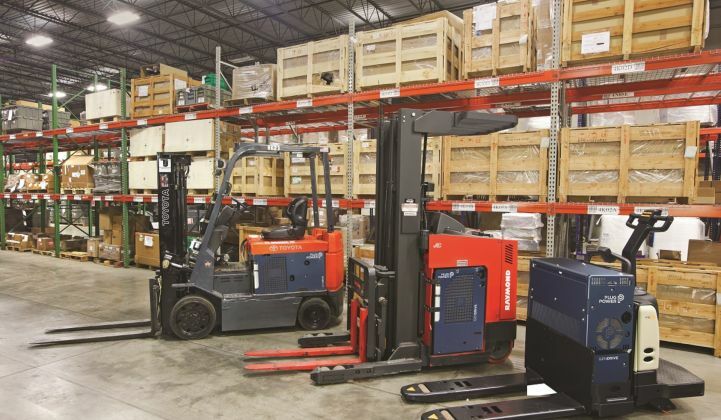 Leaner operations: Whereas separate personnel are needed to oversee lead-acid battery recharging and swapping, forklift drivers can refuel the hydrogen themselves. The client saves on labor costs. The grocers listed at the top of the article must now choose between reaping the productivity advantages of Plug’s fuel-cell technology (benefiting Amazon) or operating their distribution centers less efficiently (benefiting Amazon). For all its efforts, the fuel-cell industry remains embryonic, a fact that works to Plug’s (and therefore Amazon’s) advantage. There's limited competition, rivals are small-scale, and all players are struggling to achieve -- in industry parlance -- “negative cash burn." As competitors emerge, Plug should be able to leverage its scale and accumulated learning to improve its offerings while shrinking margins, hindering rivals' progress. As GTM Editor-at-Large Eric Wesoff notes, the list of profitable fuel-cell companies is empty, as empty as the list of profitable electric car and flow battery companies. 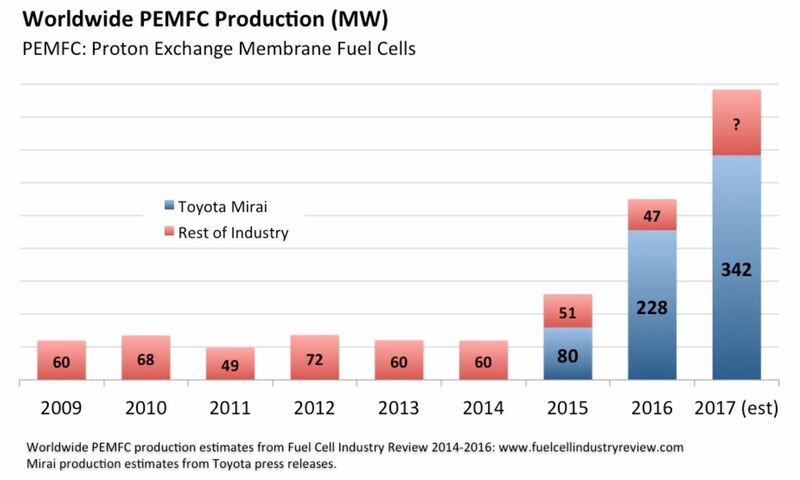 For fuel cells in particular, it’s been a century-long profitability drought. Within the industry, SFC Energy and Ballard Power Systems are likely the closest to breaking even, with SFC reporting a loss of $2.6 million on $46 million of revenues in 2016, while Ballard posted a positive adjusted EBITDA (+0.3 million) in the second half. That said, things can change. After all, the Chicago Cubs did win the World Series last year. A hockey stick. For real. Plug’s deal with Amazon comes at a “hockey stick” moment in the proton exchange membrane fuel cell (PEMFC) sector, which should offer a tailwind. Unbeknownst to most, after six years in which annual PEMFC production languished in the 50-megawatt to 70-megawatt range, production doubled in 2015, then doubled again in 2016. Almost all of the increase can be laid at the wheels of the Toyota Mirai. 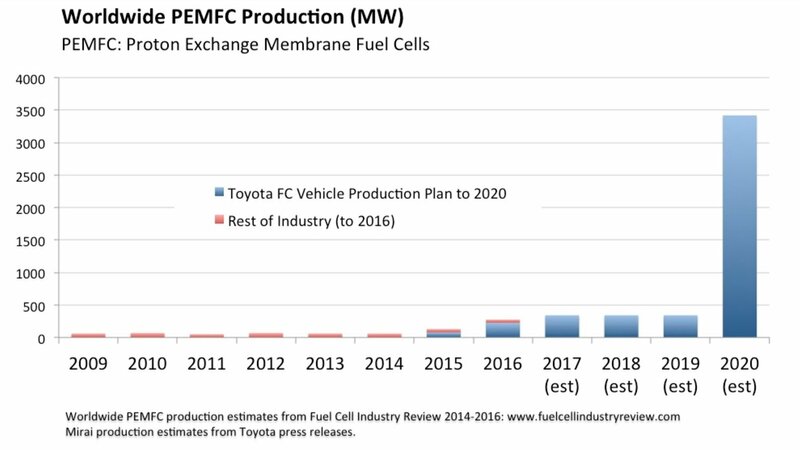 The Japanese automaker’s production plan of 3,000 Mirai units in 2017 represents about 5x worldwide PEMFC production in 2014, and its 30,000 fuel-cell vehicle sales target in 2020 would equate to 50x. Given Toyota’s determination, track record (the original Prius was developed in just 3.5 years), and roughly $50 billion treasury, its ambitions can’t be discounted like the fuel cell flights of fancy of decades past. How much better will fuel-cell forklifts fare, when key suppliers can amortize their overhead over five, 15, or even 50 times the product volume? Amazon has been quick to spot a trend before -- could this have been part of its calculus? Despite rapid growth -- it quadrupled forklift fuel-cell shipments in the past four years -- Plug Power has shown a Tesla-esque ability to generate losses, and a Tesla-esque proclivity for raising capital. From the start of 2013 through the recent Amazon announcement, Plug had received one strategic investment, issued stock six times, and arranged three loan facilities. To be fair, the leadership team deserves credit for pulling, dragging and willing the company out of the grave, and scrapping for survival until Plug could win field deployments with positive margins. That said, Amazon no doubt enjoyed the stronger negotiating position. Higher volumes should entail price concessions from suppliers, and the ensuing savings could be used to improve margins or reduce prices to attract new customers. Though Plug’s Amazon affiliation might cost it future business in some sectors (e.g., groceries, retail), its widespread adoption by both Wal-Mart and Amazon should gain the attention of businesses in other industries whose competitors have deployed them. For example, Colgate-Palmolive might follow the lead of P&G (four sites), and Pepsi might do some due diligence in light of Coca-Cola (two sites). While Wall Street is often criticized for focusing too much on quarterly results, Amazon has earned a reputation for playing three-dimensional chess, and a pretty good game of it, at that. The agreement to explore the use of Plug’s modular “ProGen” fuel-cell engines could have any number of speculative applications, including powering the inventory-movement robots from Amazon Robotics (formerly Kiva). This again assumes the improved productivity from less-frequent, faster refueling would more than offset hydrogen’s higher cost. Given Amazon’s growing logistics business (which will presumably involve autonomous commercial vehicles), the ProGen engines offer a further flanking opportunity, as Plug is exploring their use as range extenders for delivery vehicles (with FedEx) and to power airport ground support equipment (also with FedEx). But the most sweeping endgame for Amazon would be to convert its trucking fleet from diesel to hydrogen, neatly immunizing itself from the risks of cities banning diesel vehicles. Though Plug Power wouldn’t provide heavy-duty fuel-cell stacks (a task best left to auto OEMs), its role would be still more important: deploying and maintaining hydrogen infrastructure at every Amazon fulfillment center. In effect, Plug’s fuel-cell forklifts would allow Amazon to create an extensive on-site hydrogen fueling network -- one already paid for by the productivity improvements the fuel cells allow. Some upgrades would be required (Plug typically dispenses hydrogen at 5,000 psi, while the auto sector uses 10,000 psi), but these should be inexpensive compared to the cost of starting from scratch. The 15 minutes to 30 minutes it might take for tractor-trailers to load and unload their goods would be more than enough time to refuel. If semi-trucks always left the distribution centers with a full tank, far fewer third-party fueling sites would be necessary to provide cross-country or cross-continent coverage. One suspects that Amazon would be willing to switch its trucks to hydrogen, even if at a modest premium to diesel, given the productivity gains elsewhere in its operations, and the advantages of standardizing on a common fuel. The arrangement between Plug Power and Amazon comes at an inflection point in the PEM fuel-cell sector. Plug gains a deep-pocketed partner (and possible future part-owner) whose backing and productivity focus should drive significant growth in their forklift business, with upside opportunities for its ProGen modular fuel cell engine business. For its part, Amazon can repeat the flanking strategy it used to great effect with AWS, turning competitors into customers. Though Plug’s fuel cells will drive productivity improvements in Amazon’s fulfillment centers, the broader opportunity for Amazon comes from companywide hydrogen fueling infrastructure, paid for in full by the aforementioned productivity gains. Once hydrogen and fuel-cell tractor truck prices meet Amazon’s needs, the company can leverage that infrastructure to jettison its diesels, fueling its vehicles as they load and unload, qualifying to use diesel-free and ZEV-only areas, and continuing its rampage through the business world.